So cool! I exhaled on this page and gently made a big smoke cloud between me and the screen while scrolling. 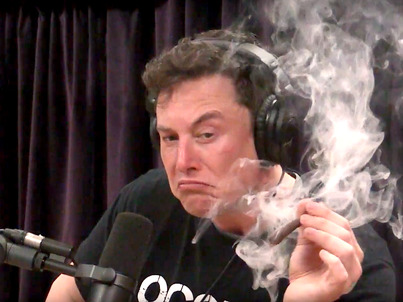 I stopped scrolling and then the smoke cleared and there was Musk with his cloud. Not a slap on the wrist, but not a summary execution either. But he gets to stay on as CEO and as board member – and apparently, he gets to keep his Twitter account, but with some board oversight (see below). Today, the SEC also sued Tesla, and this being a busy Saturday, settled with Tesla all in one fell swoop. “By engaging in the conduct, Tesla violated, and unless restrained and enjoined will violate again, Rule 13a-15 [17 C.F.R. § 240.13a-15] of the Exchange Act [15 U.S.C. § 78a, et seq.]. The $40 million in penalties that Musk and Tesla have to pay combined will be “distributed to harmed investors under a court-approved process.” Would those be the short sellers? Probably not. This settlement with Tesla is more than a slap on the wrist – particularly having to bring in two independent directors that will start nosing around some things – but it’s not exactly a summary execution. The company will now get a modicum of corporate oversight, and it might even try to tamp down on the blatant lies that Musk spews forth via his tweets in order to manipulate up the share price. In terms of the penalty for Tesla, well, its $20 million penalty is a fly speck. It represents just two business days of net losses for Tesla, based on its Q2 net loss, its largest net loss ever. So this part won’t add much to the cash-burn machine. John Goodenough has defied the American tech industry’s prejudice that says old people can’t innovate. A man old enough to be Mark Zuckerberg’s great-grandfather just unveiled energy storage technology that might save the planet. John Goodenough is 94, and his current work could be the key to Tesla’s future—much as, decades ago, his efforts were an important part of Sony’s era of dominance in portable gadgets. Over the years, Goodenough has scuffled with Warren Buffett, wound up screwed by global patent wars, never got rich off a headline-grabbing initial public offering and defied the American tech industry’s prejudice that says old people can’t innovate. Chalk up another one I called right and early. You can only sell Snake Oil for so long. If the rout sparked by an SEC investigation into CEO Elon Musk’s tweets on taking the carmaker private wasn’t enough, a subsequent tweet storm mocking the agency and an unflattering comparison to Lehman Brothers Holdings Inc. slewed off even more value. Shares extended losses for a fifth straight session Monday, falling 4.3 percent to the lowest in more than 18 months. The stock rebounded in after-hours trading, recovering about 1 percent, after Macquarie initiated coverage of Tesla with an outperform rating. “I’m now the Nothing of Tesla. Seems fine so far,” - he's become unhinged ! This week, in a classic Muskian publicity stunt, Elon Musk, founder and CEO of Tesla, announced that he no longer had a job title at the electric-car manufacturer. He had deleted his honorifics from his Tesla bio page, where he previously had been listed as chairman, product architect, and CEO, he said in a tweet. “I’m now the Nothing of Tesla. Seems fine so far,” he wrote. Hong Kong (CNN Business)Europe gave the world some of its top automakers, but it's losing out to China in the race to define the industry's future. China is the driving force in the business of electric vehicle batteries, which European leaders see as vital to the future of the auto industry that employs millions of people across the continent. It may be too late to catch up. "Europe might well see its carmakers massively moving production to China in the future," said Simone Tagliapietra, an energy analyst at Fondazione Eni Enrico Mattei, a Milan-based think tank. "This is a huge risk" for the region that's home to companies like Volkswagen (VLKAF), BMW (BMWYY), Mercedes-Benz and Renault (RNSDF), he added. Re: “I’m now the Nothing of Tesla. Seems fine so far,” - he's become unhinged ! He was always "unhinged". Just he used to be a well funded insaniac by Wall Street. Harley-Davidson has been previewing its LiveWire electric motorcycle in the United States and Europe. The motorcycle maker is in the process of remaking its business to meet its ambitious goal of attracting 2 million new riders in less than 10 years. Legendary but struggling American motorcycle maker Harley-Davidson is taking a big step toward its ambitious goal of getting milions of people excited about riding motorcycles again. The company gave Europeans their first look at its LiveWire electric motorcycle at the influential EICMA motorcycle show in Milan, Italy on Tuesday. The move is part of a drive to become a world leader in electric and hybrid motorcycles, and to attract a new kind of customer to the storied American brand. It is also a radical departure for Haley-Davidson, which has mostly been known for more than a century for its loud, brash motorcycles known as "hogs." The image has become so much a part of the brand that the company's ticker symbol is HOG. But the company has signaled it is time for a a change as the market for bikes continues to age, literally. Almost half of all motorcycle riders are 50 or older. Harley-Davidson has especially struggled. Most recently, the motorcycle maker released third quarter earnings that beat expectations, but showed the company actually lost market share. "Harley is in a tough spot here, where their core constituency is getting older and they are having a tough time attracting new people to the sport," said Raymond James analyst Joe Altobello. Many view motorcycles as dangerous and difficult to operate, for example. In recent years, the company has made an all out effort to attract more riders overall, including younger ones. The company unveiled a 10-year plan in 2017 to attract 2 million new riders by 2027. In addition to investing in electric bikes, the company has set up schools around the country to teach neophytes how to ride. Electric motorcycles are expected to be a significant part of this strategy, but the company has also indicated it may expand into scooters and even bicycles, Argus Research analyst David Coleman said in an Oct. 26 research note. "The expanded lineup may have greater appeal for women customers than the company's traditional motorcycles," Coleman said. "We also believe that this wider range of models will help to attract customers who might otherwise prefer to purchase a 'fully custom' motorcycle." Electric bikes have a few technical advantages over gas-powered motorcycles. There are no gears to shift, which could make them more palatable to beginners intimidated by the idea of having to change gears while in motion on a motorcycle. Electric motors offer peak torque immediately from a standstill. That means all the motor's power is available immediately, giving the bike extremely rapid acceleration. In contrast, internal combustion engines need to shift gears as a car or motorcycle increases speed, slowing acceleration. This is why an electric car such as the Tesla Model S P100D can go from 0-60 miles-per-hour in a lightning fast 2.5 seconds, making it one of the quickest accelerating vehicles on the planet. That said, Harley has acknowledged its new direction may raise some eyebrows, particularly among enthusiasts used to the low-end growl of its classic internal combustion motorcycles. The LiveWire does create a sound, but it is an entirely different one, more futuristic an emblematic of the bike's electric powertrain. The LiveWire is the first of several motorcycles Harley plans to introduce to refresh its lineup over the next several years. The LiveWire model is expected to debut in 2019 and will be sold at select dealerships in the United States and Europe through the end of the year. The company will release the bike's price in January. it will be a new avenue for Harley-Davidson, but the company will already have some competition. Several manufacturers are at work on electric bikes. One that has received a large amount of attention is California-based Zero Motorcycles. That company debuted its 2019 lineup at the end of October. Founded in 2006, the company already sells 4 different models. Of course, even without competitors it remains to be seen whether any company can make money on electric motorcycles, given the high costs of developing electric powertrains for cars, Raymond James analyst Joe Altobello told CNBC. He also wonders whether marketing a motorcycle that is easier to ride will be enough to attract the ridership Harley-Davidson is hoping for. "I think Harley is doing what they need to do: trying new things," Altobello said. "Just continuing on the same path is not smart, given what has transpired in the last fours year. The industry has declined year over year, at least in the United States. I am just skeptical that it is going to be enough to really reverse course." And what of that patented exhaust sound. The buggy whip strikes again. I expect that instead of the Tesla of motorcycles, it's more likely to be the Edsel of motorcycles. I don't see Harley riders making the switch, just because they DO like that patented exhaust note. The old Harley commercials just wouldn't be the same without the engine roar. Can the world produce enough cobalt for electric vehicles? THE ONLY thing that can accelerate as fast as an electric car is the price of the most expensive metal in its batteries. Once a niche input used to strengthen turbine blades, cobalt’s value has soared since it started to feature in modern electronics. Most phones need a few grams’ worth, and every car requires 5-10kg. That adds up. 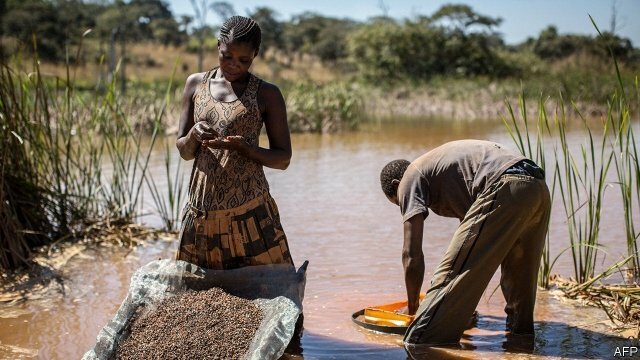 Many business models are based on ample reservoirs of cobalt that experts warn do not exist. At $4000 an Oz. roughly, how much of that price do these hard workin' miners make ? 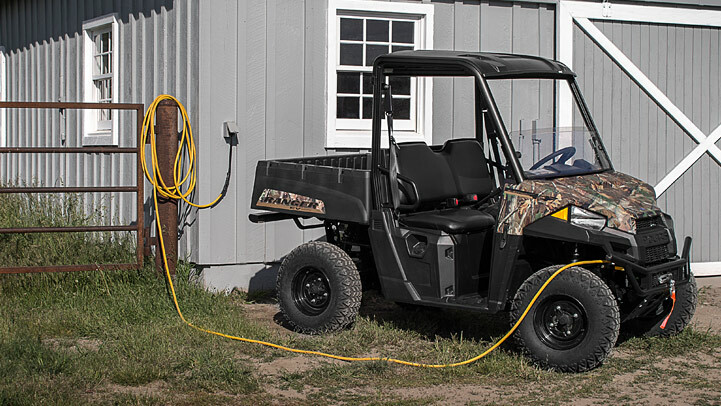 I am seriously considering instead of getting a new supercharged turbo Cripple Cart, getting an EV Polaris Ranger instead in the Spring. This is the model Peter bought. Brand new 2019 model going for $12K.